Move over, minivans. The 2019 Honda Piot is the new standard in family vehicle perfection. 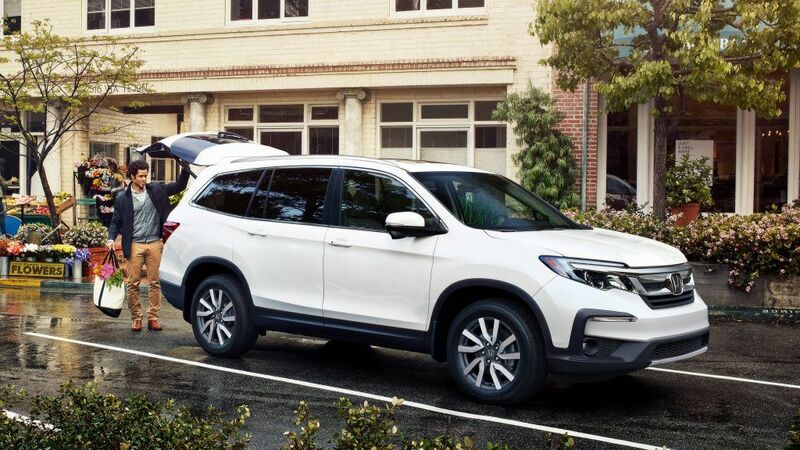 There are many features in the Pilot that make the 2019 model the best fit to keep you and your family safe and comfortable on the road. The higher-level trim Honda Pilot models have an 8-inch touch screen display audio system. This system comes equipped with Apple CarPlay, Android Auto, and available Honda Satellite-Linked Navigation System. WIth the interior tech features at an all time premium, the BlueRay player is available below the individual temperature control section that offers heated or cooled seats as well as individual temperature units. Following underneath the BlueRay player insert is a wireless charging port. The digital dash is uncluttered and very simplistic. It allows you to customize what you would like to see based on your set preferences. The back seat of the Pilot is meant for your family! For the kids especially, it is large enough to comfortably fit two large car seats in the second row. The third row is still spacious with large windows in the back, and of course entertainment. The Pilot is meant to make everything easier to communicate and keep an eye on your little ones in the back. Cabin Talk is a system that is incorporated into the display audio system so that your voice in the front can carry through the speakers and linked headphones in the back. The Honda Pilots engine has plenty of power for a family vehicle. With an equipt 3.5 Liter i-VTEC V6 engine, sport mode is an option and makes for a nice, smooth ride. The vehicle comes ready to withstand all terrain, offering three different driving modes: snow, mud, sand. These features will have your terrain transitions more stabilized and making for a comfortable ride. All safety features in the Honda are starting to come standard. With the backup camera, blind spot warning and emergency braking. For more information on the 2019 Honda Pilot, and what makes it the ideal vehicle for your family, visit us at Henley Honda today. Our Sales team will be happy to show you all of the features that make this vehicle the perfect fit.